(Article by Kyoshi Sid Rayford) Hanshi Sid Campbell, after a lengthy illness with cancer, passed away in the Highland Hospital of Oakland, California on Monday, 8-18-2008. In the early morning hours of Saturday 8-16-08, Hanshi Campbell began to feel an enormous amount of pain in his shoulder, back, and hip areas. Fortunately, Renshi Calvin Tam was available to transport Hanshi Campbell to the nearby hospital. Over the weekend, Hanshi Campbell's condition became worse and on Monday afternoon (8-18-08), Renshi Calvin Tam called to inform me that the doctors had given Hanshi Campbell only a few hours to live. I immediately left Merced and traveled to the hospital in Oakland to see Hanshi Campbell who was heavily medicated and struggling for his next breath. Hanshi's struggle for the next breath became much worse and to the point of it becoming clear that he was in the process of passing on. I began to hold his hand and speak to him and thanking him for the many years of friendship and for the love that he had given to us all. Several people were there to see him including Hanshi Tosh, Hanshi Bob Mashmeier, Mark Gerry, Calvin Tam, Tim Wessling, Jerrell Smith, Nathan LeBlanc, Scott Sandkohl, Manny Madlansacay, Jude and Rali Anthony, Al Colavito, Johnny Baldizan, Robin Klassen, and many other students and friends of Hanshi Sid Campbell. Hanshi Campbell's breathing began to dramatically slow down and at about 8:00 PM, I could feel Hanshi Campbell's grip on my hand relax and he was no longer breathing. Hanshi Campbell had received his final promotion to eternal life and his days of suffering had come to an end. It then became very real to us all, that we had witnessed the final promotion and passing of a true legend. The pioneer of Shorin-Ryu Karate to the Western World is now at peace, leaving behind scores of people who love him and owe to him a huge debt of gratitude. Sid Campbell reached out and touched thousands of people in his lifetime and anyone who got to know him, was privileged to do so. Hanshi Campbell, we love you and will miss you forever. Kyoshi Sid Rayford and Sensei Richard Cantu took several trips to Oakland to visit Hanshi Campbell after he was released from the VA Hospital. 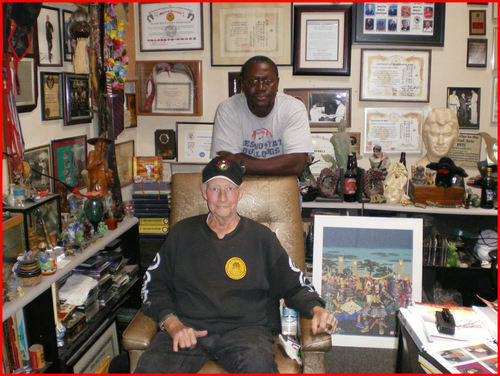 The picture below is the last photo taken of Hanshi Sid Campbell on 7-5-2008. Photo taken by Sensei Richard Cantu.